Let's talk about it ! Beauty is awesome and unique. Everyone is beautiful in their on way. We must continue to strive to keep ourselves up by properly grooming to maintain our health and our beauty from head to toe. You never know what is around the corner for you. So build your mind, dress beautifully, stay healthy and be the person you desire to be. Build your empire with style. Your feet are important. They carry you on your job opportunities and help you provide for yourself and your family. Keep your feet healthy and beautiful. You want to keep your feet healthy; meanwhile, living a beautiful and exciting life. We must take some precautions in taking care of things that may effect our feet health now and in the long run. Some common feet problems are circulation problems and burning sensations.
."A burning sensation in the feet is common among diabetics with peripheral nerve damage. It can also be caused by a vitamin B deficiency, athlete’s foot, chronic kidney disease, poor circulation in the legs and feet (peripheral arterial disease), or hypothyroidism. ", according to Web MD . Diabetics should check their feet everyday for cuts or swelling, also make sure your blood sugar stay at a healthy range. We can help maintain the beauty of our feet with a nice relaxing pedicure. The massage from the pedicure relaxes your body, reliving some of the stress from your workload, school load, or family load. Relieving the tension causes you to smile more, which makes your appearance more appealing. Relieve the stress and move on with your life . The same goes for a nice massage as you are getting a relaxing shampoo. It's a wonderful and relaxing feeling. Your feet can accessorize your outfit. Keep your toenails neat and cleaned out. You can use a pumice stone to smooth calluses; meanwhile, soaking the other foot and watching a little TV. Make a night of it, or go get a professional pedicure. Treat yourself or someone you care about. You deserve it. Your feet will thank you, by feeling great and looking very beautiful and groomed in a pair of sandals. Maybe even slip on them high heel or flat. Is your shoe game on point ? With the right touch they will stand out with glamour. A little polish will bring your outfit and appearance all together in a unique and exquisite way. Men can also keep their toenails nice and clean, which will give him a nice groomed and handsome look. So ladies and gentlemen, take care of yourself from head to toe. Look beautiful. feel beautiful, and have a beautiful attitude. It will take you along way in life. I'm wishing you a wonderful and healthy life. Don't forget, also Protect your eyes while making a fashion statement! Are you motivated to work out? 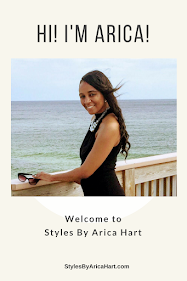 Styles by Arica Hart participate in various affiliate programs.